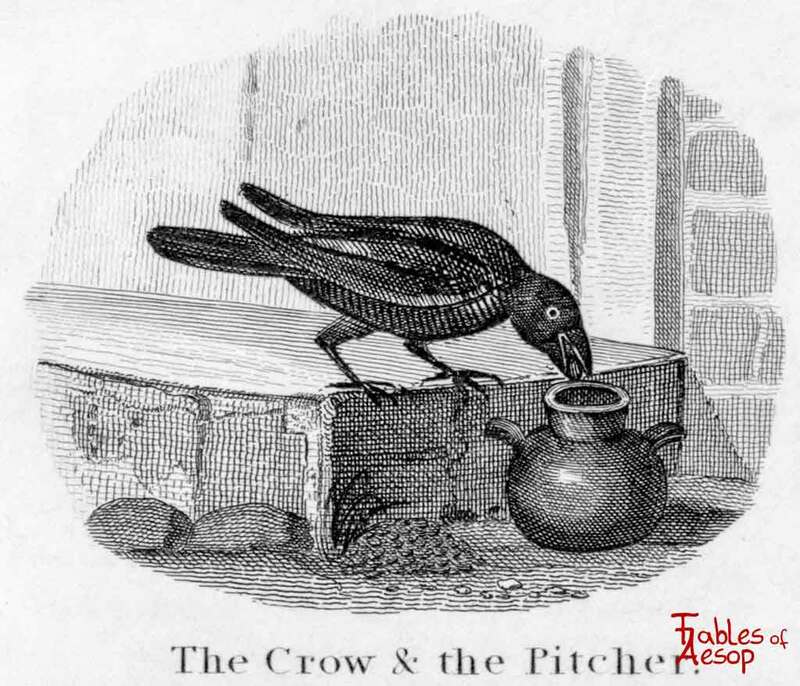 A thirsty crow wanted water from a pitcher. 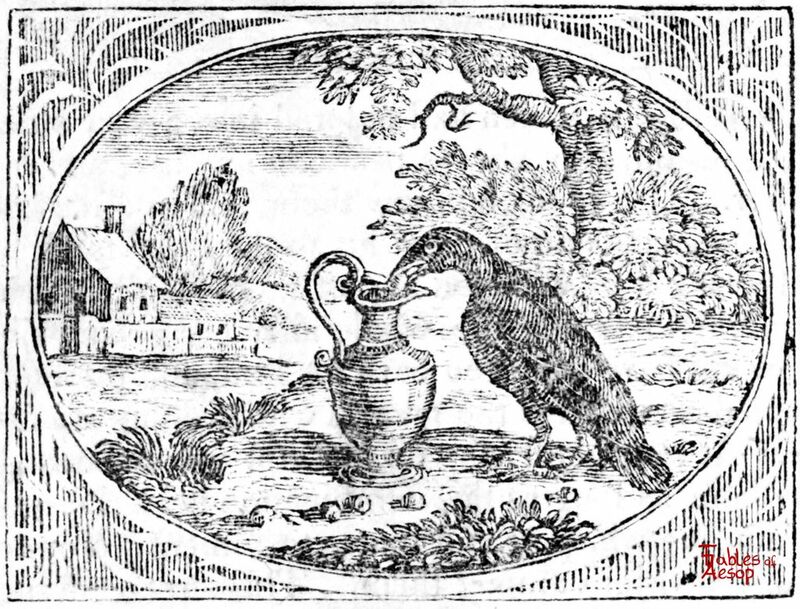 He filled it with pebbles to raise the water level to drink. Clever! But puddle or pool, her fever to cool. Then said she, “Woe is me! Which promised the needed assistance. For scarcely a cup-full was in it. Said she; “but let’s see! —She did so, and so did obtain it. Arrives not by luck, but by using one’s brains. A Crow, ready to die with thirst, flew with joy to a Pitcher hoping to find some water in it. He found some there, to be sure, but only a little drop at the bottom, which he was quite unable to reach. He then tried to overturn the Pitcher, but it was too heavy. 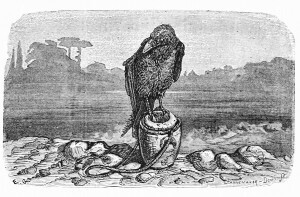 So he gathered up some pebbles, with which the ground near was covered, and, taking them one by one in his beak, dropped them into the Pitcher. By this means the water gradually reached the top, and he was able to drink at his case. 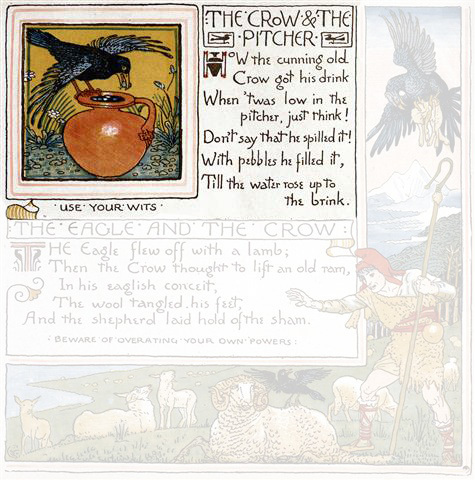 A CROW, ready to die with thirst, flew with joy to a Pitcher, which he beheld at some distance. When he came, he found water in it indeed, but so near the bottom, that with all his stooping and straining, he was not able to reach it. 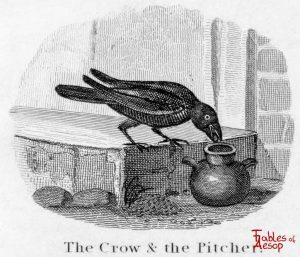 Then he endeavoured to overturn the Pitcher, that so at least he might be able to get a little of it. But his strength was not sufficient for this. 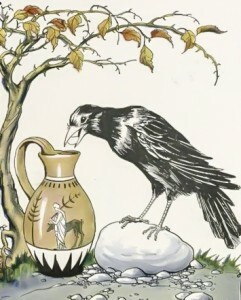 At last, seeing some pebbles lie near the place, he cast them one by one into the Pitcher; and this, by degrees, raised the water up to the very brim, and satisfied his thirst. Many things which cannot be effected by strength or by the vulgar way of enterprising, may yet be brought about by some new and untried means. A man of sagacity and penetration, upon encountering a difficulty or two, does not immediately despair; but if he cannot succeed one way, employs his wit and ingenuity another; and, to avoid or get over an impediment, makes no scruple of stepping out of the path of his forefathers. Since our happiness, next to the regulation of our minds, depends altogether upon our having and enjoying the conveniences of life, why should we stand upon ceremony about the methods of obtaining them, or pay any deference to antiquity upon that score? If almost every age had not exerted itself in some new improvements of its own, we should want a thousand arts, or at least many degrees of perfection in every art, which at present we are in possession of. The invention of any thing which is more commodious for the mind or body, than what they had before, ought to be embraced readily, and the projector of it distinguished with a suitable encouragement. Such as the use of the compass, for example, from which mankind reaps much benefit and advantage, and which was not known to former ages. When we follow the steps of those who have gone before us in the old beaten track of life, how do we differ from horses in a team, which are linked to each other by a chain or harness, and move on in a dull heavy pace, to the tune of their leader’s bells? But the man who enriches the present fund of knowledge with some new and useful improvement, like a happy adventurer at sea, discovers, as it were, unknown land, and improves an additional trade into his own country. When ’twas low in the pitcher, just think! Don’t say that he spilled it! Till the water rose up to the brink. Sitibunda cornix reperit urnam aqua plenam, sed erat urna profundior quam ut exhauri a cornice possit. Conatur igitur vano molimine aquam effundere, sed non valet. Lectos igitur ex arena lapillulos iniectat. 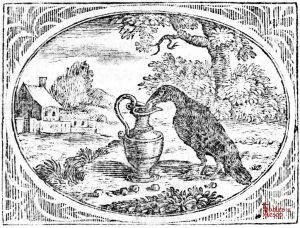 Hoc modo aqua levatur et cornix bibit.